With the location secure, the Oakville Art Society had to renovate the space to be suitable for the needs of an art studio and gallery. The Cottage needed to be insulated in order to be able to run classes in the winter months. The roof had to be re-shingled, a window needed repairing and there were walls that needed to be knocked down to make studio space. 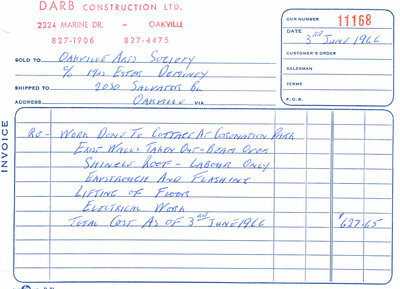 OAS consulted with Darb Construction and received the estimate of $2,408.50 which was well above what they could afford at the time. 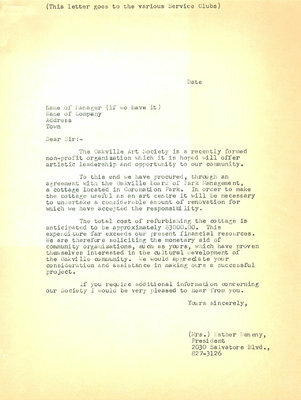 With the generosity of people and organizations in the community donating both money and materials, OAS was able to finish renovations by the fall of 1966. Below are just a few examples of various donations from people and companies that made the renovation possible. 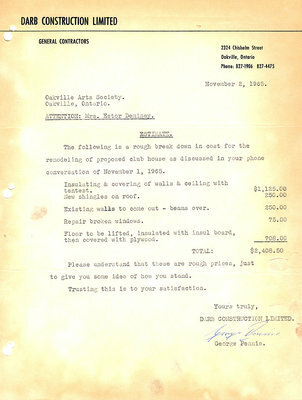 The detailed estimate to remodel the Oakville Art Society's new home. 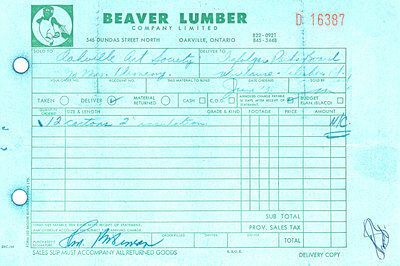 Receipt from Darb Construction for the amount of $627.65. 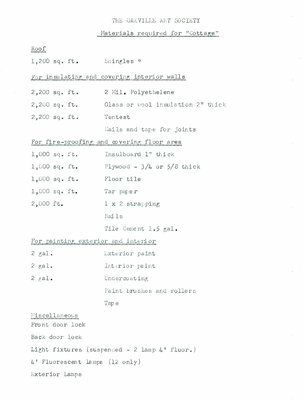 Some of the materials required for renovating the Cottage included: shingles, tentest, glass or wool insulation 2" thick, insulboard, plywood, floor tile, tar paper, nails, exterior paint, interior paint, undercoating, paint brushes, front door lock, back door lock, and lighting fixtures. 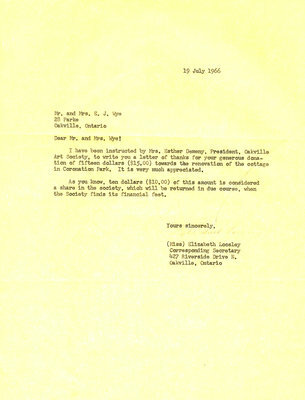 Realizing that the cost of renovating the Cottage was beyond the Society's means at the time, Esther Demeny turned to the community of Oakville for assistance. 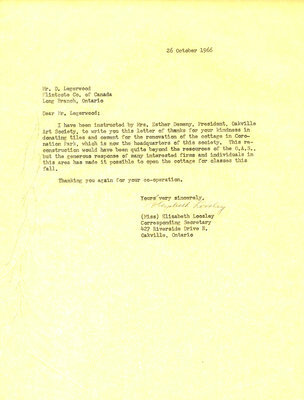 This is a draft of a generalized letter which she sent out to various businesses, organizations and clubs asking for donations. Flintkote Company of Canada was very generous as they donated tiles, adhesive and tile cement to OAS free of charge. 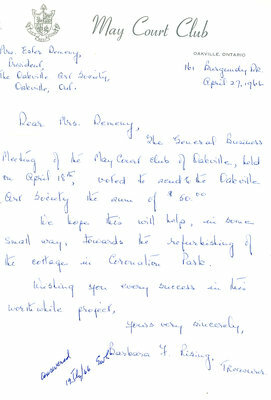 A letter of thanks written by Miss Elizabeth Loosley (OAS secretary) on behalf of President Esther Demeny for their generous donation of materials. 12 Cartons of 2" insulation is ordered to insulate the cottage. No charge for these supplies! Miss Sonia Matthews donated $10.00 to the renovation effort and receives a sincere thank-you from OAS. The General Business Meeting of the May Court Club of Oakville, held on April 18th, voted to send to the Oakville Art Society, the sum of $50.00. We hope this will help you in some small way, towards the refurbishing of the cottage in Coronation Park. 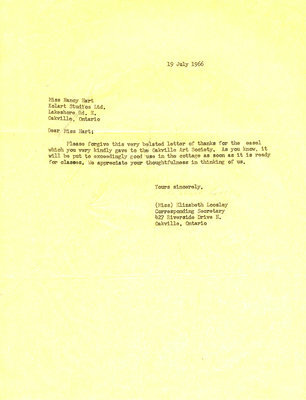 A letter of thanks to Nancy Hart who donated an artist's easel. 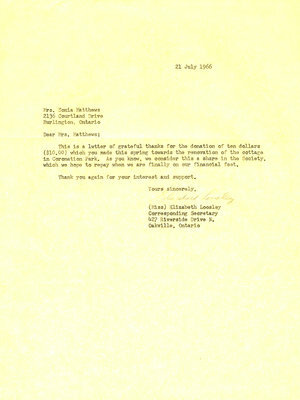 A letter of thanks for the $15.00 donation from Mr. and Mrs. E.J. Wye. A portion of the donation ($10) went towards a share in the society and would be returned when "the Society finds it's financial feet." 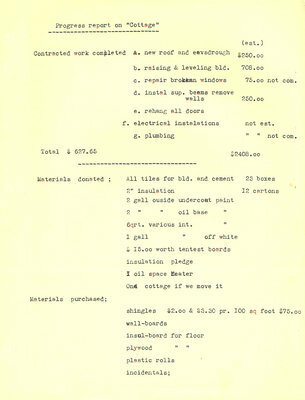 A progress report detailing the work that had been done on the Cottage to-date. 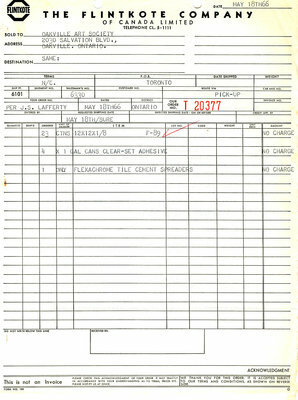 The report breaks down what was estimated and what was actually paid, donations of materials, and purchased materials.